On Saturday we took a drive up to Masham in Wensleydale to see the Masham Sheep Fair. We stopped on the way at the Cover Bridge Inn, a CAMRA award winning pub near Masham. In addition to the Theakston’s offerings, they also had Blue Moon on tap. Add another one to the list of things-you-don’t-expect-to-see in England. The sheep fair itself was lots of fun. There were so many different kinds of sheep. After wandering around the pens for a while we headed over to the field behind the church for some more excitement. Sheep racing is a pretty intense sport. You could place bets on which sheep you thought would win, with a third of the takings going to charity. The group next to us had put £5 on green, Lamb-borgini. The race took a thrilling turn when the green sheep started running back towards the start. Luckily the “jockeys” got him straightened out and he took first place! We then watched an exhibition of sheep dog skills in which the dog’s job was to herd some ducks through an obstacle course. After all that excitement we were in need of some refreshments, so it was quite convenient that Theakston’s was handing out vouchers for a free half pint of their best bitter. We wandered over to the brewery and sampled their wares. We will definitely be returning to Masham in the future, since we haven’t yet taken the tours of Theakston’s or Black Sheep Brewery. After riding past it on the train to York half a million times, we finally stopped in at the National Railway Museum. It is literally right next door to the train station and it is free (aka “donations accepted”), so we really had no excuse not to go. And it was a surprisingly good museum. There were, of course, a lot of trains of varying ages. There were steam engines with tall chimneys, diesel trains and even a Japanese bullet train. 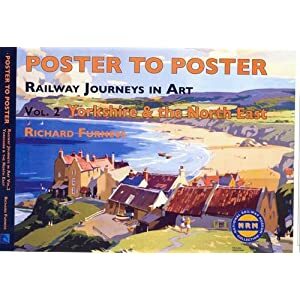 Recently we purchased a really cool book of railway posters. Ever since I have been on the lookout for some vintage rail posters from the area. The gift shop had a lot of of them, but they didn’t have the exact ones I have been looking for in posters (only postcards). They did, however, refer me to ssplprints who do have them! Hooray! To get there we had to take the A170 up Sutton Bank, a hairpin turn with a gradient of 1 in 4! Poor Aygo didn’t like that one very much. Rievaulx is smaller than Fountains Abbey (see previous post) but more ornately carved and very beautiful. Nearby Helmsley is an adorable Yorkshire village with castle ruins overlooking the town. We recently took a day trip to Middleham Castle in Wensleydale. This castle was the boyhood home of King Richard III. The ruins were pretty extensive. Parts had modern wooden stairs and platforms added so you could go up to where the different levels would have once been. On the way home we stopped in Masham for Sunday roast and a pint. We didn’t get to stop at the breweries there, but I’m sure we’ll be back. Continuing on our journey, we headed up to Inverness. We visited nearby Culloden Moor to see the battlefield and the biggest slugs you’ve ever seen! A boat tour of Loch Ness sounded like fun, so we headed over to that most famous of Lochs. We totally saw Nessie, but she was too quick for us to get a good picture. We did manage to capture our reaction upon seeing the mysterious beastie. Our journey then took us along the Great Glenn towards Skye. The scenery in this part of Scotland is simply amazing. A short distance before Skye we encountered our new favourite castle, Eilean Donan. Crossing the bridge, we continued on to the Isle of Skye. There we visited Neist Point lighthouse and Portree, the largest city on Skye. On the way back from Portree there was an accident that shut down the only A road between Portree and the bridge. Luckily we got down the “Scenic Route – Unsuitable for Caravans” detour before any caravans got stuck. After leaving Skye, we headed South towards Oban, stopping at scenic view points along the way. We spent one night in Oban and then drove down the Western edge of Loch Lomond, stopping at lots of laybys on the way for photos. We then headed toward our ancestral home in Paisley (right outside Glasgow). We met up with some Scottish relatives for dinner and checked out Glasgow. We visited the Kelvingrove Museum and saw the Mackintosh House. Charles Rennie Mackintosh was a very influential architect and designer who was one of the main forces behind the “Glasgow Style” of Arts and Crafts. We then stopped at Wigtown, Scotland’s National Book Town, before heading back to Yorkshire. After driving 1,550 miles around Scotland in a van with 6 adults, we were pretty tired. But it was an amazing trip! At the beginning of August, we had family visit us! After arriving in the UK we took them to Fountains Abbey to keep them awake and get over jet lag. Later that week we took a day trip to Knaresborough. We rented a boat and rowed around on the Nidd, which we have wanted to do for a while. It was fun and gave a nice view of the picturesque railway bridge. After hanging around town for a few days we rented a van and headed up to Scotland! Our first stop in Scotland was Edinburgh. We saw Edinburgh Castle, Holyrood Palace, climbed Arthur’s Seat, and took a bus tour around town (amongst other things). We then headed to Stirling to take in Bannockburn and Stirling Castle. After leaving Stirling we continued on to Pitlochry, where we spent the night. The next morning we stopped by Queen’s View on Loch Tummel. The weather was rather damp and misty so we couldn’t see very far. It was very beautiful, though. We followed that up with a walk near Killiecrankie pass. We got lunch at an old watermill, still in use to make the flour used in all the breads at the cafe. We then continued on to Dalwhinnie Distillery to see whiskey being made (and sample some, of course). We went on a walk from the town of Ripley to the city of Ripon. Using modern technology we tracked the route and put it on google maps. We also tracked our elevation. It was mostly flat. We lucked out with the weather. It was in the mid-60s and only a little rain. Unlike most of the walks, instead of sheep we found cows. Eventually we ended up at the Ripon Cathedral. Here is the group, expect for Randy who is taking the picture.